I hope everyone had a nice weekend. Mine was full of cooking, house hunting, cleaning and working out. Saturday morning started off with a bowl of oats full of apples, peanut butter, raisins and ground flax while I updated my blog with the seared scallops from Friday night’s dinner. Then I headed out for a quick 3 mile run with Sullie before meeting with our realtor to look at houses. On Saturday night we finally tried Lebowski’s for dinner. It’s a local bar and grill that actually has great food. I had two sliders – one turkey burger and one “beef on weck.” I’d never had a beef on weck before – delicious! I also had a side of garlic fries because I heard they were the thing to order. This was a big splurge for me – I’m usually all about the sweets and pass on fried food – but they were totally worth it. They had some great looking salads and healthier fare that I’ll have to check out next time. We’ll definitely be going back to Lebowski’s! When we got home I put together an overnight French toast to have for breakfast the next morning. I was not feeling French toast after our feast but my feelings had changed Sunday morning when I woke up! I’ll be blogging about the French toast soon. It was the perfect weekend treat. Sunday was devoted to mostly cleaning and organization (our apartment desperately needed it) and of course, my 90 minute hot yoga class at Charlotte Yoga with my very favorite teacher, Suzanne. I look forward to this class all week! Seriously amazing. I saw on the schedule that Grace, the founder of Charlotte Yoga, was assisting in the class so I knew I’d better get there early. I’m so glad I did, the class was packed and they ended up having to send about 20 people away. The room was packed with almost 50 sweaty, hard working yogis! I actually planned on making Duck a l’Orange last night for 68 Days of Gourmet but I just did not have the energy for it after my day of cleaning and the yoga class. I ended up making Teriyaki Chicken with the chicken breasts I got on sale at the grocery Friday. I was browsing chicken breast recipes from Gourmet online and thought this looked simple and healthy. Brandon and I decided that while this was a nice basic dinner it wasn’t anything special. Neither one of us is super fanatical about teriyaki chicken but if you are then this is a great recipe for you to try. 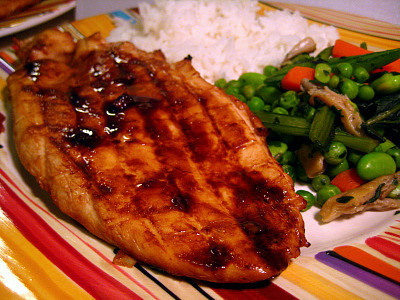 It’s so simple, healthy and the homemade teriyaki sauce is way better than the stuff you buy in a bottle. We didn’t dislike this; it’s just not something I think we’ll make again. I adapted this by changing the sauce to pretty much double it after reading a lot of reviews to do so. Was definitely necessary. I also used boneless skinless chicken instead of boneless, skin on. So the duck is on the agenda for tonight. Wish me luck! This is my first time preparing duck. Blog update to come soon! In a large, shallow dish, whisk together soy sauce, ginger, honey, Sherry, vinegar and garlic. Pound chicken breasts between two sheets of plastic wrap or wax paper to about ½ inch thickness. Place chicken in marinade and turning to coat. Marinate for at least 20 minutes, turning once. Preaheat the broiler to high. Transfer chicken to the oiled rack of a broiling pan, reserving marinade. Broil about 6 inches from heat for 5 minutes. While chicken is cooking, boil the reserved marinade until reduced by half. Remove chicken from oven and flip chicken breasts. Brush marinade on tops of chicken and return to broiler for 5-8 more minutes, or until internal temperature reaches 160 degrees, careful not to overcook. Thanks for the tip about Tavern on the Tracks. My husband is now an avid fan of Beef on Weck so I’ll have to take him there to try it out!